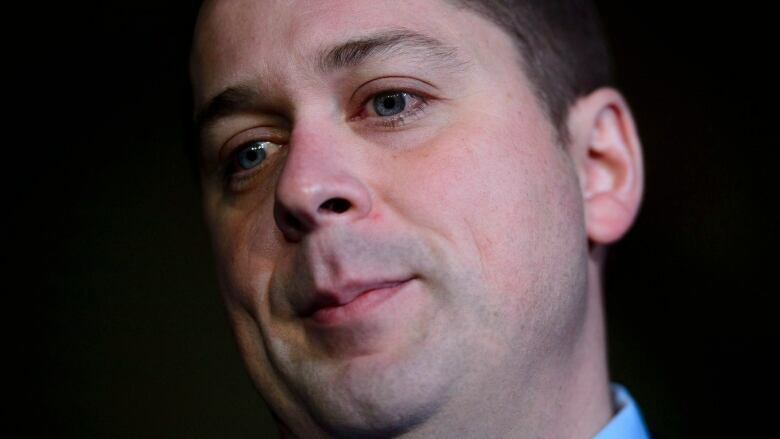 As the next federal election approaches, Andrew Scheer's Conservatives might be asking themselves whether they can win without a strong NDP. Things aren't going very well for the NDP. The party sits at 15.8 per cent support in the CBC's Poll Tracker, an aggregation of all publicly available polling data. That number would put it on track for its worst performance since 2004. At that level of support, the New Democrats likely would win around 20 seats — less than half of the party's current standing in the House of Commons. Singh hasn't been able to make a very strong impression on Canadians so far. The impression that he has left is trending negative. 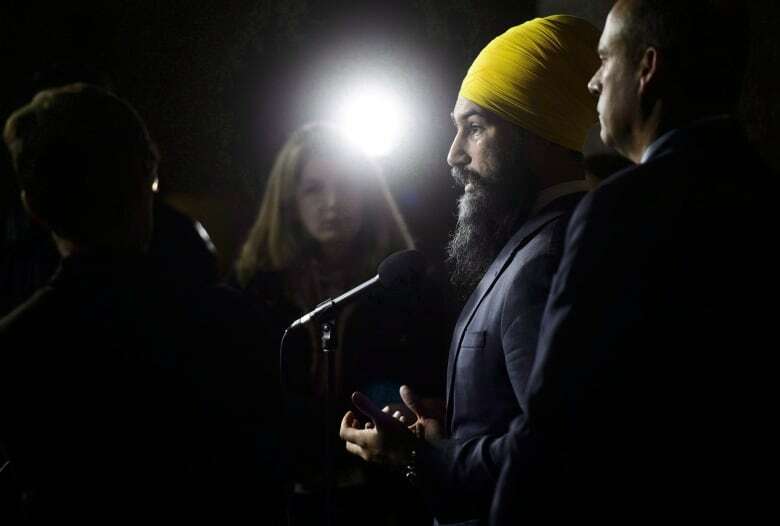 The latest survey from Abacus Data found just 19 per cent of Canadians holding a positive view of the NDP leader, a number that has slid consistently from the 24 per cent Singh scored at the beginning of the year. Nanos Research finds that just eight per cent of Canadians pick Singh as the best person to be prime minister, putting him only two points ahead of Elizabeth May, leader of the single-seat Greens, and six points ahead of Maxime Bernier, who formed the People's Party of Canada only a few months ago. Singh's numbers have been wobbling back and forth in Nanos's weekly tracking. An anemic NDP is part of the reason the Liberals still lead in the Poll Tracker with 37.8 per cent support — but the Conservatives are playing a role in that as well. The Conservative Party has 32.2 per cent support, a figure virtually unchanged since the 2015 federal election. Certainly, Scheer would be trailing the Liberals by a smaller amount if the NDP was eating away at Liberal support — but he'd also be doing better if he was flipping swing voters over to his own party as well. That's why a struggling NDP is a bad omen for the Conservatives. A strong NDP can be a cause of a weak Liberal Party. It can also be a symptom. It's no secret that Conservatives tend to welcome strong New Democrat polling. A robust NDP was cited as a necessity by Jenni Byrne, Stephen Harper's campaign manager, after the party was defeated in the 2015 federal election. The historical record shows why. In the 18 elections held since the New Democrats' first contested an election in 1962, the party has averaged 14.8 per cent of the vote whenever the Liberals have formed government. They have averaged 19.6 per cent of the vote in the elections that ended in victory for the Conservatives (or their predecessors, the Progressive Conservatives). The tipping point for the Conservatives seems to be around 17 per cent support for the NDP. New Democrats have managed 17 per cent of the vote or less in eight elections. The Liberals won seven of those; in the eighth election, in 1962, John Diefenbaker's PCs were reduced from a record-breaking majority government to a slim minority. Of the elections that saw the NDP receive more than 17 per cent support, however, six ended in victory for the Conservatives and four left the Liberals in power (in two of those four Liberal wins, however, the party was kept to a minority). Two of the three majority governments the Conservatives have secured since 1962 coincided with the NDP's best ever results — in 1988 (20.4 per cent) and in 2011 (30.6 per cent). The Conservatives' third majority, in 1984, happened as the NDP took 18.8 per cent of the vote — its fifth-best result. It's a small sample size, but it does suggest a pattern. When the NDP is struggling, the Liberals have a high likelihood of winning. When the NDP is doing well, the Conservatives tend to have the edge. With the New Democrats currently under 16 per cent, the Poll Tracker accordingly gives the Conservatives less than a one-in-eight chance of winning the most seats in an election held today. It isn't, however, a simple matter of vote-splitting between Liberals and New Democrats. For example, the PC landslide majority government in 1984, when Brian Mulroney captured 50 per cent of the vote, had nothing to do with a split centre-left vote. Instead, the NDP's score was a reflection of the weakness of the Liberals at the time: in that election, the Liberals lost votes to the PCs as well as the NDP. There isn't a strong regional character to this pattern. In elections the Conservatives win, the New Democrats have tended to perform six percentage points higher in British Columbia and Quebec than they do when the Liberals win. In Ontario, the NDP tends to perform four points higher in elections the Conservatives win. A boom in NDP support in any one region isn't enough to push the Conservatives over the top: they need New Democrats to be doing well pretty much everywhere. A large part of the reason the Liberals are looking good for the 2019 election right now is the drop in NDP poll numbers Quebec — the party is down nine points there from the last election. The Poll Tracker suggests that the Liberals are in a position to pick up about 14 seats in Quebec at the NDP's expense. The Conservatives can take advantage of the NDP's slide in a few areas of the country, particularly in the Prairies. But the Liberals have potential for gains in B.C. 's Lower Mainland as well, making it a bit of a wash. The Conservatives have little to gain directly from a weaker NDP. But they have much to gain (indirectly) from a stronger NDP. There could be dozens of ridings around the country (in the Greater Toronto Area, especially) where Liberals and Conservatives are looking at close contests next year, and where the NDP has little historical support. In those ridings, even small shifts in the New Democrat vote could have large effects on the results. So Scheer might spend the next 11 months looking at two sets of numbers in the polls to get a sense of his chances in 2019 — his own and Singh's.